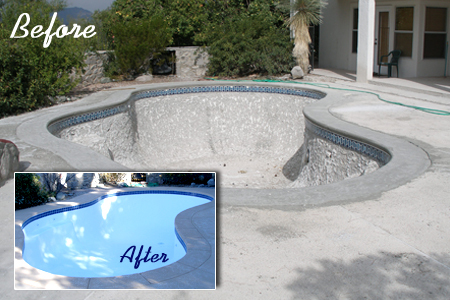 We specialize in pool resurfacing for plaster & painted pools; eliminate pool surface problems. Fiberglass surface is superior to plaster for a variety of reasons. As plaster wears, roughness increases. Fiberglass is always smooth. No scratched feet and toes. Any substantial pool movement can cause cracks and leaks. Fiberglass adds structural strength to pool shell. Prevents leaking. Plaster has little resistance to stains and blemishes even if surface has been recently applied. Resistance to stains with easily cleaned surface. Algae adheres to porous surface. Smooth, dense, non-porous surface prevents algae from adhering. High chemical requirement at all times. Reactive surface Noticeable reduction chemical usage due to the inert nature of fiberglass. Makes pool chemicals more efficient. Unsightly when stained/deteriorated, whereas fiberglass maintains attractive appearance. Depends on application. Re-plastering often separates from original surface (poor adhesion). Material limitations reduce the durability of plaster. The superior corrosion resistant and inert properties of fiberglass ensure exceptional durability. Very sensitive to incorrect water chemistry. Plaster surface easily compromised. Inert surface of fiberblass is less sensitive to out-of-balance water chemistry. Depends on water chemistry, maintenance regime, plaster mix, and application technique. Fiberglass exceeds that of plaster. Time tested with 25 years industry experience. Salts/plaster constituents will adhere, and create a very abrasive surface. Due to the inert nature of fiberglass, no leachable material is available to cause roughness. Surface remains smooth. Plaster requires brushing and attention. With Fiberglass, no brushing is needed. Allow to cure, then start-up.